Indonesia's national team is meeting up in Jakarta ahead of two friendlies early next month and although coach Luis Milla's focus is on the SEA Games in August a number of familiar names have been called up to add experience. After exceeding expectations at last year's AFF Suzuki Cup when they lost in the final to Thailand Indonesia will be looking to build on that showing against Cambodia and Puerto Rico but they do so with an almost completely overhauled squad. Milla has been helped this year by regulations that force clubs to include a minimum number of young players but at the same time the Liga 1 campaign is contuning with no break for international fixtures and Maryianto for example played for Persipura yesterday, scoring against Barito Putera before having to fly on to Jakarta to meet his team mates ahead of flying to Cambodia on Monday. I love a good old fashioned bruiser of a centre half as much as the next English man. That is why, even now, I am still purring after seeing Per Mertesacker put in the kind of shift Arsenal fans have been missing since the Adams/Bould/Keown/Campbell era came to an end. The tall German, playing his first full game since god knows when swallowed his 'thou shalt not pass' pills before the game and he was enormous. It also explains why I have taken to PS TNI's Argentine defender Facundo Talin (pictured right 's Short Fusewith the ball). He is not afraid to get stuck in from the first minute and, pardon the pun, is proving to be a guy you most definitely do want in the trenches with you. But only when he is playing football and intimidating opponents with his no nonsense approach. The 31 year old defender came to PS TNI when Ivan Kolev replaced Laurent Hatton after three games. Apart from a short stint in Romania and Bolivia he hasn't played outside of his homeland before and as we see all too often playing football in Indonesia, let alone living here, has its own challenges that need to be adapted to. Facundo is lucky in one respect. Team mate Leonel Nunez is familiar with the region and the pressures that can come from unlikely sources having played for Johor Darul Ta'zim in Malaysia. He will know all about what happens on the field and off it and will be able to pass that experience on to his compatriot. I've only see PS TNI a few times this season but in the last couple of games I've seen Facundo practising his Indonesian language skills on the match officials far too often. These refs, say what you like about them, they have officiated some of the best and worst. They know how to handle some fresh off the boat blow hard and when refs react it is the whole team that suffers. Ivan Kolev replaced Facundo on the hour mark against Persela with his team leading 3-0. They eventually held on for a narrow 3-2 win after the defender went off. Now, I'm not sure why Facundo was replaced but at half time he had to be guided away from the ref by a team mate. What the hell? His team was leading 3-0, why talk yourself into trouble? 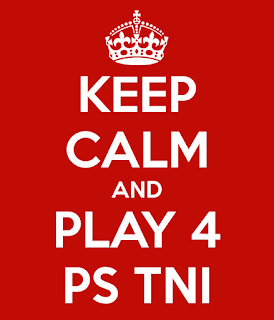 I have enjoyed watching PS TNI this season but their aggression and in your face actions could prove costly. They lost 4-1 away to Madura United with a number of notable absences thanks to fines and suspensions. Kolev knows he doesn't want any title bid derailed by ill discipline and he has made noises to that effect saying his wants his players to calm down. And that is, supposedly, one of the jobs for the foreign players. Be the cool head while others are seething, be the hand on the shoulder when fists are clenched. 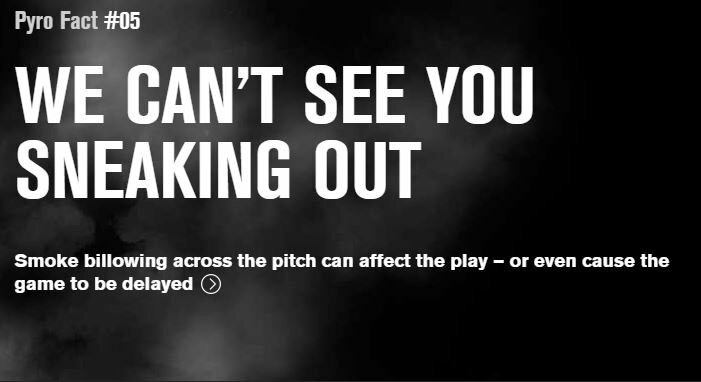 That is Facundo's role but he won't be able to fulfil it properly until he realises making an enemy of the ref won't win him or his team mates any prizes. Persibat aren't a team I have written about much in the 11 years of Jakarta Casual. Since they were founded in 1974 they haven't won any honours and played their football in either the second tier or even lower, They come from the town of Batang on the north coast of Java, not to far from Semarang. This year sees them play in Group 3 of Liga 2 alongside the likes of PSS, Persijap, PSGC, PSCS, Persibas, Persip and Persibangga. A strong group in a strong liga for sure. With the Liga taking a rest for the fasting month Persibat are seventh in the eight team group, five points off a play off spot. For now Liga 3 beckons. Yet things shouldn't be all doom and gloom. Persibat boast the second best defence in the group, they have conceded just three goals in their five games; only second place PSS boast a better defence having conceded just a single goal. Like many teams, Persibat's problems lie at the other end of the field having scored just three goals all season. Coach Lukas Tumbuan has stepped down and, rarely for an Indonesian coach, has come out against what he perceives to be interference from the club management. He says the management have interfered with the work programme he has tried to introduce and even though he stipulated when he arrived at the club he wouldn't accept any intervention it has, he claims been ongoing. Despite the talk of intervention in how the club is being run from on high, a number of coaches have been linked with the vacant hot seat. Among them is Daniel Roekito who guided Persik to the Liga Indonesia title back in 2006 and saw them they in the AFC Asian Champions League the following season. As for Lukas? Having burnished his credentials work with the West Java side at the National Games he is being linked with a couple of Liga 2 sides so shouldn't be out of the game for too long. Was this the proverbial game of two strikers? As PS TNI bounced back from suffering their first defeat of the season away to Madura United last week they made light of the number of first teamers missing from their line up last night with debutant Sansan Husaeni grabbing his chance with a couple of goals that were ultimately the difference in a thoroughly absorbing game at Pakansari Stadium last night. The 27 year old striker, pictured left, hasn't had that much of a career to be honest. Since making his debut for Persija back in 2009/10 season he has flitted around the clubs having short stints with Jakarta FC 1928 and Persija (both Liga Primer Indonesia sides), Persekap and most recently Persikad and yet here he was showing more experienced pros how to finish not once but twice. Certainly had Ivan Carlos, Persela's Brazilian striker, showed a similar assuredness in front of goal we may have seen a very different outcome. From the early minutes Carlos was presented with chance after chance as Persela, buzzing with confidence after a recent run of three games unbeaten had seen them climb from the relegation zone to mid table, set about a home side shorn of a number of first team starters. But Carlos' shooting boots had been left behind in Lamongan as chance after chance went begging and it was Sansan who drew first blood after fine work down the right flank on 23 minutes. Leonel Nunez made it 2-0 five minutes before half time and when the ref finally blew the whistle bringing the first 45 to a close the feeling was that PS TNI's sheer ruthlessness in front of goal would be enough for them to go on and secure the points. When Sansan netted his second early in the second half that was surely it. 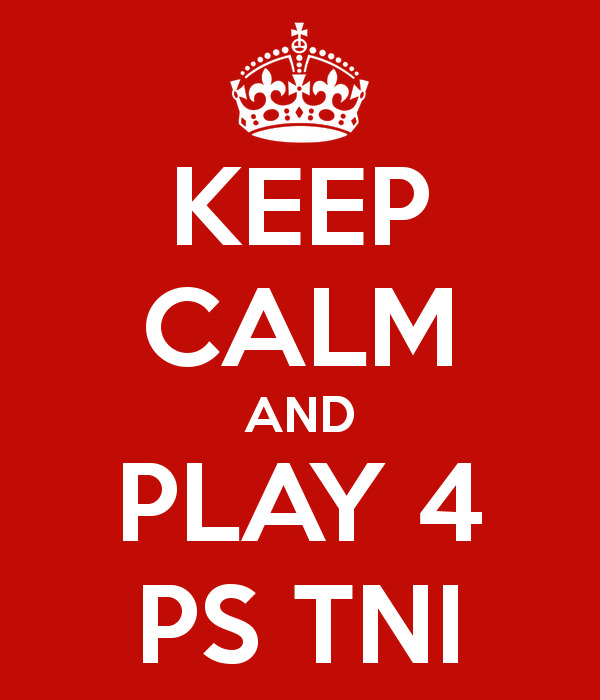 Game, set and match to an understrength PS TNI side. Coach Ivan Koelv began ringing the changes, Sansan coming off on the hour mark and, surprisingly, central defender Facundo Talin on 67 minutes. The Argentine defender had, as usual, spent an inordinate amount of timing discussing finer points of the laws of the game with the ref but he put in a commanding shift as usual as his team struggled at times to handle the rapier like Persela attacks. Credit to Carlos, he kept going despite his misses, there is of course one thing worse than missing so many chances and that is not creating any chances. and his hard work finally paid off when he pulled one back with 13 minutes on the clock. Ahmad Birrul Walidan made it 3-2 with four minutes remaining to set up a nailbiting final few minutes for the home side. There was still time for the ref to ensure the football would not have all the headlines when he forgot about the advantage rule and halted a promising Persela break to send Gunter Triaji off for a reckless challenge. It was a poor tackle yes but the decision by the ref was poorer. Persela can feel themselves unlucky to head home with nothing but coach Herry Kiswanto can at least feel satisfied his team did put in a shift. As for Sansan, it's been a long wait but finally he has made his mark on the top flight! The issue of club licensing can be a tricky subject inn Indonesia thanks to a scattergun approach to its implementation. When the Indonesia Super League began back in 2009 for example all clubs were required to have coaches with A licenses but this has not always been the can. Witness Persib for example. In 2014 when they won the ISL their coach Djadjang Nurdjaman lacked the necessary badges but was allowed to remain in his post. But when Persib entered the 2015 AFC Cup he wasn't allowed the coach the team and another coach was brought in for those games. Going back to 2009 Persitara had already seen Jacksen F Tiago and Richard Azreg come and go in the hot seat. Facing sanctions from the ISL if they couldn't appoint a coach the side from North Jakarta finally appointed Dirk Buitelaar, a 71 year old Dutchman with a brief, according to the club at the time, to focus on the technical side of things. Indeed teamsheets suggest Buitelaar was named as a Technical Director. Forward in time to 2015 and it was licencing issues that saw the PSSI suspended by FIFA. The outfit that oversees sports in the country raised concerns over Arema and Surabaya United which the PSSI ignored. This of course led to security clearance for games being with held and the government ceasing to recognise the PSSI as the people in charge of the game. There is no doubt the need to license clubs is vital. Without it clubs cannot enter AFC domestic competitions while some clubs may not be too concerned about that for other, more ambitious, more professional clubs it is a matter of great importance. Licensing covers a number of areas including infrastructure, financing, sporting, legal and personnel & administrative. Crucially, licences cannot be transfered which could be a cause of concern for a number of teams. At the start of the 2017 Liga 1 season there were some concerns Perseru would not be able to play their home games at their Marora Stadium because access was difficult with some clubs facing trips of more than 24 hours factoring in transit time. That issue was addressed with the introduction of regular flights between Jayapura and Biak. Given then that the Marora Stadium had been given the green light, and assuming the stadium met all the benchmarks why has Perseru's home game with Persija, scheduled for Sunday been postponed? In the letter sent from Liga to Persija on Wednesday among the reasons stated for the postponement include the floodlights which would not, apparently, ;support' a night fixture. Ok, the floodlights are inadequate yet the stadium was approved for Liga 1 games? Ordinarily Perseru games kick off in the afternoon but for the fasting month all games are evening kick offs to allow the players to break the fast before kicking off. No one anticipated this could be an issue when the go ahead was given to use Marora Stadium? Not for the first time administrators are reacting to situations rather than anticipating them. And what does this incident say about the whole licensing process in Indonesia when something as basic as floodlighting is overlooked? The game has now been rescheduled to early August. Love them or loathe them it seems the uniform sides making their debut in Indonesia's top flight are in it for the long haul and if the first few games are anything to go by they are among the division's entertainers with goals galore in their games. PS TNI are now 6th following their 4-1 reverse at Madura United last week but their 7 games have produced a league high of 22 goals while Banyangkara's games have produced 20 goals. Plenty of entertainment then for the fans and with players like Evan Dimas (Bhayangkara) and Manahati Lestusen (PS TNI) the two teams field some of the most exciting young players in the country. So, what's not to like? 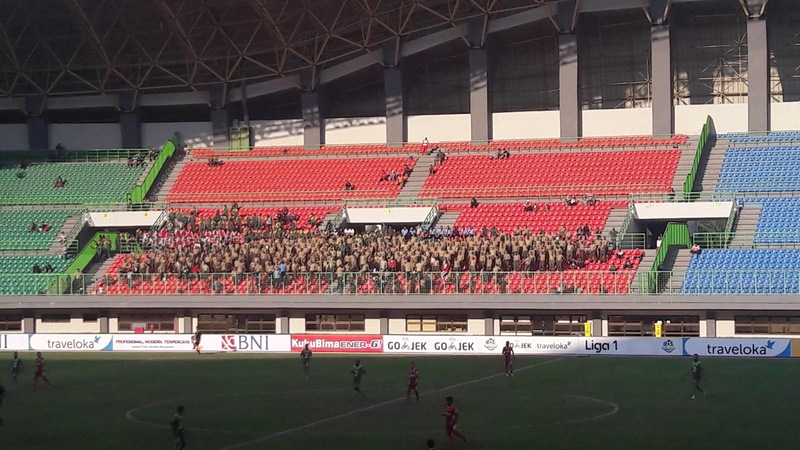 When Bhayangkara hosted PS TNI at Patriot Stadium recently the game was watched by 4,850 fans, a season high for the team once known as PS Polri. Or Surabaya United. Or Bonek FC. And among that number were very few paying punters with the vast majority of the crowd being off duty personnel from the respective service having a day out with their mates, given free tickets and a packed lunch. PS TNI's best crowd was 6,100 against Persib, a figure that would have been well padded by away supporters who wouldn't have had to travel far. Both sides of course lack a natural fan base having been parachuted into towns with well established local sides. Bekasi of course has been without a league side for a while now following the merger of Persipasi with Pelita Bandung Raya and their subsequent sell out to Madura, hundreds of miles to the east. There is a third side, Persikasi, who usually play in the lowest reaches of the football pyramid. Meanwhile Persija have chosen Patriot Stadium to be their home base while Bung Karno is being renovated ahead of the Asian Games next year and they of course regularly bring crowds in excess of 20,000 to their home games. Bhayangkara's average attendance is a mere 3,700 despite the ease of access to the stadium. That number is 18% down on last season's average when they played in Sidoarjo though of course it is likely to increase substantially when/if Persib and Persija come to town. To be fair the cops have made efforts to attract local support with the formation of a supporters club, called Bhara Mania, but it is early days and there is no way of telling how many fans they will be able to attract from the Bekasi area. PS TNI's average crowd of just over 2,500 is the second lowest in Liga 1 and is more than 50% down on last season when they also played at Pakansari Stadium. The army side's stadium, like the venue in Bekasi, is new and holds around 30,000. Cibinong however is already home to a local side, Persikabo who play in Liga 2 and while there were times last season when some of their fans attended PS TNI games that doesn't seem to be the case this season. For sure, many fans are annoyed at the way in which the military sides have suddenly arrived on the scene by purchasing more established sides' licenses. Unlike other leagues in South East Asia this is the first season with both a military and police backed side in the top flight so we are in virgin territory here but lesson from around the region suggest neither side will be successful in attracting a fan base beyond people who share the same uniform. Let's look at Malaysia for example. PDRM (fans pictured left) and ATM (above) have been around for years now and this season find themselves playing in the second tier Premier League. Unlike Indonesia where clubs outside the top flight can still attract healthy attendances as far as the average Malaysian football fan is concerned if you are not in the Super League you don't exist. Like Indonesia, both PDRM and ATM lack a viable home base and tend to move from stadium to stadium. This year the Cops started the season at Paroi, home to Negeri Sembilan and their biggest crowd of the season, over 4,000, came when they hosted their co tenants back in February. They have played their most recent home games in Melaka with no evidence of fans turning ut in large number since the move. ATM on the other hand are playing in Tanjung Malim and when they hosted PDRM the attendance was recorded as 153. Back in 2012 though and ATM were the minted club of Malaysia. They were being called the Manchester City of Malaysian football, made some big money signings and won the Premier League at a canter, scoring 72 goals in their 22 games, as well as finishing runners up in the Malaysia Cup. And that was it. They finished mid table in the Super League and in 2014 only escaped relegation by goal difference. Twelve months later they finished 11th with a meagre 11 points from their 22 games and were back in the Premier League after losing a play off and last season finished 11th. The dreams of becoming a major player in local football soon fell apart and with Johor Darul Ta'zim changing the benchmark ATM couldn't compete or didn't want to. I saw ATM play at Kelantan in the Malaysia Cup semi final and they were backed by a reasonable away support. Certainly more than are currently watching them. No glory, no fans. Thailand take the uniform fetish even further. They have an Army United, Police Tero, Navy and Air Force Central with the middle two in Thai League 1. Navy average 2,700, the Cops 2,000. In Thai League 2 Army are pulling in less than 1,000 while the Air Force have a division high average attendance of 3,722. Doncha love Wikipedia?! The numbers show that once a uniform side drops out of the top division in their respective country base commanders lose interest and because these clubs lack a natural fan base they end up playing in front of small crowds which only swell should there be a scent of a promotion challenge. The implicit message is supporters don't really want to follow a uniform side, they prefer to support a team with which they can identify. It's not rocket science for football fans and even in Singapore they seem to appreciate this as they rebranded their own uniform sides as Home United and Warriors in a bid to attract support from the wider community. For me I'm just enjoying the opportunity to see some regular football and when schedules allow I am happy to go along and see both teams. But if there is a conflict and for example other more established sides are playing at home then I would prefer to go and see them. I'm English and I don't feel uniform sides have a place in professional football and judging by the crowd figures that is a sentiment shared by others. It is perhaps one of Indonesia's more understated derbies but a mere 20 kilometres separate Persikabo's Pakansari Stadium from Persikad's Merpati Stadium. There has been bad blood between the two sets of fans in the past apparently but the one time I saw them meet there was little in the way of violence. The two teams met last weekend at Pakansari Stadium with the Persikabo support feeling unhappy with their team's start to the season and the threat of their beloved side in Liga 3 is looking more likely by the week. Persikabo lost the game 2-1 leaving them bottom of Group 2 after five games with just a single win to their credit. Given the geographic nature of the group there are plenty of local derbies which allow for the Persikabo support to travel in reasonable numbers meaning more fans have witnessed the poor start to the campaign. With nine games left to play Persikabo are already six points behind second place Perserang with the fans fully aware only the top two sides are assured of a place at least in Liga 2 next year. They lost and the game was marred by a handful of fans invading the fans to try and get at the club officials. Security eventually arrived and detained the pitch invaders but trouble continued outside the ground when some fans congregated outside the main entrance in a bid to release their mates. Interestingly, at a time when so many fans and clubs are quick to blame the coach, Persikabo fans' ire is directed towards the club management with one fan blaming the club's current predicament on the management who, they say, are not open. The supporters, he says, are disappointed with the management team and are really worried the club could be relegated. Liga 2 is now taking a break for the fasting month and will return in July with Persikabo fans hoping for a change in fortunes when the team travel to Karawang to take on Persika. 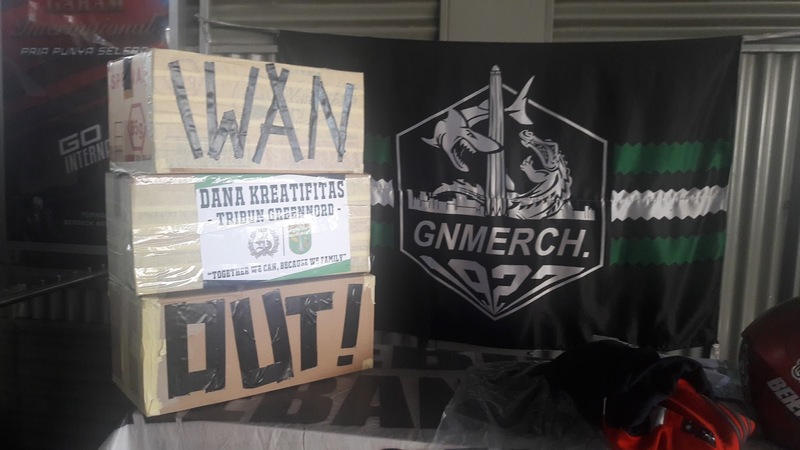 One of the reasons why Persebaya fans fell out with their last coach Iwan Setiawan, before the infamous Martapura incidents, is they felt he didn't understand and or respect the culture of the football club and its fans. They felt he was quick to boast but his boasts were rarely matched by actions on the field. Bearing that in mind it is interesting that a number of foreign coaches say they are interested in the opportunity to coach the football club. Among them is Laurent Hatton who coached PS TNI for their first three games of the season before being replaced by Ivan Kolev. It seems Hatton hasn't been scarred by his experience and is still in Indonesia hopeful of another job here. 'I hear Persebaya have just sacked there coach. Who knows, I could go there,' he has been quoted as saying. One coach with slightly more experience in Indonesia than Hutton is Misha Radovic. The Serbian born coach has previously worked with Pelita Jaya and Persisam (remember them?) and played for Bonnyrigg White Eagles when I was following St George in the old National Soccer League in Australia. He says he is ready to handle the pressure from the Bonek who want to see Persebaya back in the top flight. While those three coaches do have some kind of pedigree in Indonesia none come close to Carlos De Mello. The Brazilian, now with Liga 2 side PSGC, was part of the Persebaya side that won Liga Indonesia back in 1996/97 and retains fond memories from his time in Indonesia's second city. One coach who has ruled himself out of the running for the job is Timo Scheunemann. He recently stepped down as coach of Persiba and following rumours linking him with the job in Surabaya he has said he will be focussing on his family and his outside work as well as helping to train new coaches entering the profession. While the names above are by no means definitive and obviously exclude local coaches it would appear the front runner could be De Mello...were it not for the fact he is currently coaching a rival Liga 2 side with ambitions of their own. UPDATE - respected Persebaya fan website Emosi Jiwaku suggest Angel Alfredo Vera, Jaya Hartono and Aji Santoso are among the candidates for the vacant seat. Vera led Persipura to the Indonesia Soccer Championship last season before being surprisingly replaced on the eve of the new campaign. Santoso of course is with Arema while Hartono is with Liga 2 side Sragen United. Manchester United, Bayern Munchen, Real Madrid. These clubs are giants in their countries, someone sneezes within the stadium or training ground and the whole world knows in seconds. Persib are on the same level, at least within Indonesia. Different media are always hanging round the club because they know stories are clickbait, especially when things are going wrong. But are things going wrong? Yes, they drew 2-2 with Borneo at the weekend and are three points behind leaders PSM. They are still unbeaten. Young players like Febri Haryadi, Gian Zola and Billy Keraf have come through and made an impression on the notoriously hard to please Bobotoh. So why is so much of the news gloomy? Twice, Persib have gone into the final seconds of games leading 2-1 only to see the ref blow the final whistle and they end up with a single point to show for their efforts. First it came away to PS TNI when they led 2-0 with a few minutes remaining. Drew 2-2. Then the Borneo game. Trailing 1-0, they clawed themselves back into contention, led 2-1 only to miss a penalty and concede a late, late goal and drop more points. Those four points irk. So does the manner of the final 20 minutes against Borneo. Persib manager Umuh Muchtar is usually good for a quote or six. In the headline greedy English media he would be on a par with Jose Mourinho for a go to person by journos looking for some words of wisdom. Following the disappointment of the Borneo draw Umuh didn't disappoint. He was angry Michael Essien, the team's star marquee signing, missed the penalty. Hell, he was angry the Ghanaian had even taken the spot kick with Vladimir Vujovic the clubs appointed taker. Essien's kick was high and wide, this video shows it from a number of angles. Umuh wasn't finished. He then slammed Indonesian international midfielder Raphael Maitimo who was alleged to have been laughing on the team bus after the game. Umuh feels Maitimo wasn't being contrite enough and sharing in his team mate's disappointment at dropping two points. In response to criticism on social media Maitimo did an Eric Cantona and said 'Big trees catch a lot of wind' which hasn't done much to endure him to the faithful. Coach Djadjang Nurdjaman didn't escape either. Umuh warned the coach's position could be evaluated if there is a poor performances in their next game, away to Bali United. Just a reminder, Persib are second and are unbeaten this season. They also have the best defence in Liga 1. They have kept clean sheets in five of their seven games. They are also seven points ahead of rivals Persija. So it's not as if Persib are having a poor season. All this of course begs the question why the club went ahead and signed a player they knew was carrying an injury. I am often asked what Persib fans expect and sadly the only answer I have is to win every game or sweat blue blood doing so. Persib fans expect their side to win, win well and play with a swagger. I think there is also an element of frustration with team selections so far this season. Essien and Maitimo won't come cheap, neither would Carlton Cole, and coach Djadjang is perhaps under pressure to play players he may not have had a role in signing. That means other players, terrace favourites, are getting overlooked as the coach seeks to juggle his expensively assembled, and very talented, squad. Coaches have an unenviable task at the best of times. In Indonesia their duties lie beyond picking the best XI as they seek to accommodate the whims and fancies of powerful figures at the football club and the dreams and aspirations of the fans on the terraces at the same time as winning games. Djadjang won the Indonesia Super League in 2014. This is the first chance they have had to defend that title and while the team may not have started as spectacularly as the Bobotoh would like surely he deserves the opportunity to try and get his team of all stars to perform at the highest level week in, week out over a sustained period of time and not just seven (unbeaten) games? 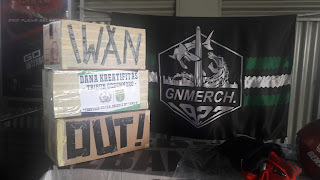 Just yesterday I had planned to do a post praising Persebaya as a club who were sticking by their coach even as the supporters were calling for his head and some had undertaken to boycott their beloved team until Iwan Setiawan had gone. One reason why the club had chosen to be faithful to the coach despite his misdeamours in Martapura was an unwillingness to upset the mood or the atmosphere among the squad. I must admit in my time hear I had never come across such thinking before and felt it was worthy of praise. Typically clubs are quick to fire a coach as soon as the first murmers of discontent echo round the terrace. 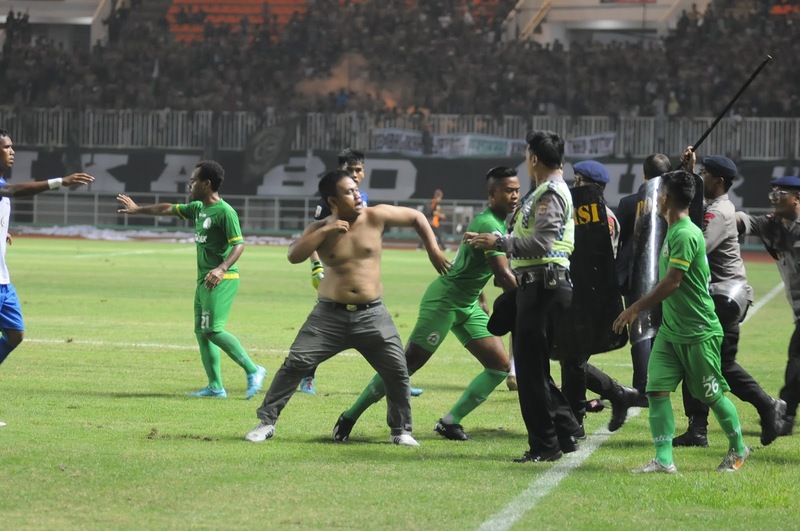 Despite protests in the last two games, including Iwan's initials appearing in a choreo separated by a pig's head, Persebaya's new owners thought appeared to be of sterner stuff as they put team spirit first. They weren't going to let the coach off that easily though and his one match suspension was doubled meaning he wasn't in the dug out when the team travelled to Yogyakarta to play PSIM. They came from behind to draw 1-1 meaning they had collected four points from two games since Setiawan had been suspended. Win their game in hand against PSBK and they would go top of the group. However this morning the club announced they had decided to end Setiawan's contract after all. The decision was taken, the club said, after carrying out an evaluation over the last couple of weeks, never sure what that means, and taking into account the atmosphere among the players and the supporters. The club are now looking for a replacement though as far as I'm aware no names have been mentioned yet. Persib for 24 hours at least share top spot in Liga 1 with PSM. Both teams have 13 points and both have a similar goal difference. Victory for the Makassar side would see them go three points clear but the fact remains Persib are still unbeaten after seven games and handily placed to protect their title they won in 2014. But the fans ain't happy. Yesterday's 2-2 draw at home to Borneo saw some fans stay behind after the game to jeer the players with one supporter yelling he was embarrassed by the team. Embarrassed? Bloody hell, some people think Arsenal fans are entitled. We saw #DjanurOut trending after Persib had drawn their opening two games of the season; it is trending again after yesterday's draw. What would the reaction be if they lost? Despite going 1-0 down against Borneo yesterday, Persib clawed their way back into the game with a nicely taken goal by youngster Gian Zola and the reliable old warhorse Vladimir Vujovic turning in at the far post. From 1-0 to 2-1 up in 12 minutes isn't a bad fightback. The turning point came in 70 minutes when Michael Essien missed a penalty, skying his kick high and wide. Borneo went on to equalise in the last minute through a glorious strike from Matheus Lopes. Yes, a disappointing way to drop two points but not the end of the word, surely? Not an embarrassment? When Carlton Cole and Essien arrived back in April I tweeted at the time if they were expecting any kind of honeymoon they had arrived at the wrong club. Their past deeds meant nothing in the eyes of the demanding Bobotoh who had their own definition of success. To be fair, missed penalty aside Essien hasn't done to badly, two goals in his seven appearances so far. But Cole has struggled to make an impression with just over 100 minutes playing time spread across three games. No goals and one yellow card. Goal His Failed. That was 7th May during Persib's fifth game of the season. There were more banners at yesterday's game. 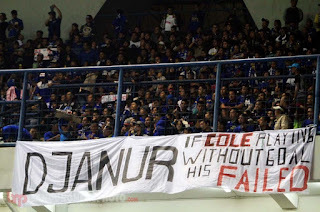 When Cole arrived in Bandung he said he was looking to score between 10 and 20 goals in the season but for whatever reason it's not happening for him. Looking from the outside it looked a strange signing from the very start. As a player he is similar to Sergio van Dijk and although van Dijk missed a few games through injury surely that was no reason to fork out a large amount of cash on Cole when something short term was needed. The Cole signing has all the marks of a vanity purchase. Undoubtedly Carlton Cole is in a difficult position. He is at a club where the coach may not have had him on his wish list, struggling to get game time and is becoming a lightning rod for anger against the coach. None of this is his fault. 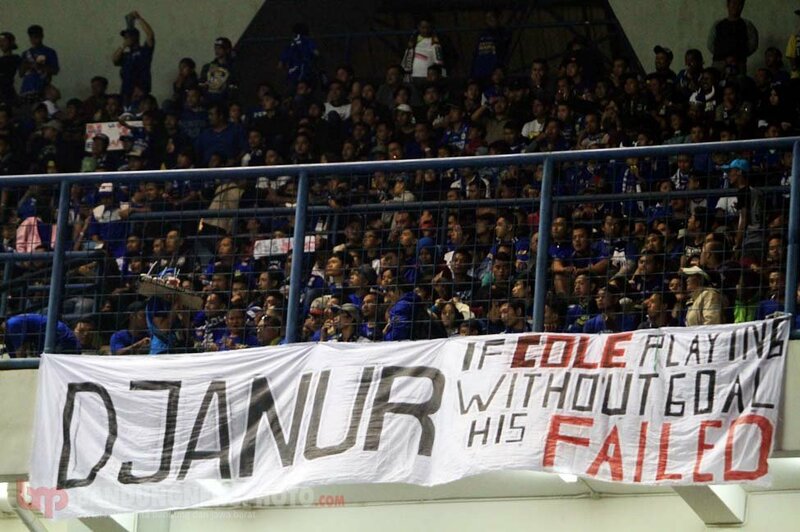 He is not the first player to go through this at Persib where the fans readily admit they expect the best from day one. But they are also quick to offer respect to players who can turn their fortunes around. Cole has only to speak with his team mate Kim Jeffry Kurniwan who was the victim of the boo boys last season. He stuck in there, worked hard, kept doing what he is good at and turned the fans around. Cole can do the same. He just needs game time. Unfortunately he may not even get that. Yesterday in my match preview I wrote about how Madura United needed their strikers to step up to their plate in their clash with PS TNI and boy did they reply in kind. They thumped the unbeaten visitors 4-1 at Bangkalan Stadium with the kind of performance we have been waiting all season to witness. Marquee player Peter Odemwingie was again at the heart of Madura's performance with his fifth goal of the season but this time not only were Madura able to take the lead, they were able to hold on to it, something they hadn't managed in their last two games. The experienced Greg Nwokolo opened the scoring, and his account for Madura United on 17 minutes and Odemwingie made it 2-0 just before half time. The visitors replied early in the second half when Leonel Jorge Nunez made it 2-1 but any hopes of a fightback were quelled when Slamet Nurcahyo made it 3-1 on the hour mark. Dane Milanovic put the icing on the cake four minutes later, his second in two games, to end PS TNI's unbeaten start to the season and catapault Madura United up to second place. But it is Odemwingie who will get the headlines and if we are yo have marquee players then surely the Nigerian is a hit. While Carlton Cole has struggled at Persib, Odemwingie has fitted straight into a Madura side already well blessed with striking options and the adoring fans have taken to calling him The Great Odemwingie after his electrifying start which also includes three assists. PS TNI may point out they were missing important players like Abduh Lestalahu, Manahati Lestusen and Elio Martins but a performance like this has been in Madura United's locker all season. The only surprise is it has taken so long. An example of the changing face of Indonesian football later on today when Madura United host unbeaten PS TNI at Bangkalan Stadium. The last time these two sides were slated to meet in league competition was May 2015 in the aborted Indonesia Super League campaign when both clubs looked very different. Back then, what am I talking about, it was only 24 months, Madura United were known as Perspasi Bandung Raya with the Bekasi based club having taking over Pelita Bandung Raya. PS TNI were known as Persiram, a side based in Papua but which played their home games in Java. Both sides have this season earned a reputation as being hard to play against, something that was rarely applied to their former incarnations. PS TNI are unbeaten of course going into this game and are buzzing after defeating top of the table PSM last time out 2-1. However their physical approach hasn't been winning them many admirers and tonight they line up against Madura United without Manahati Lestusen and Abduh Lestalahu who have already earned the wrath of match officials and the PSSI disciplinary committee. The military backed side though are not only about an in your face approach. They have some lads who can play a bit. There may have been some surprised faces after three games when the club ditched their coach Laurent Hatton and two of their foreign players but the players don't seem to have been too concerned. Indeed the addition of Leonel Jorge Nunez (pictured left), one time Johor Darul Ta'zim, and Facundo Talin should be seen as a step up in class on Aboubacar Leo Camara and striker Aboubacar Sylla as was evident from their performances against PSM on Monday night. Facundo has sipped into the heart of defence and already looks at home. He looks to be an old school defender, one who howls at the moon if he thinks it would help his team mates, and one who seems to have adapted quickly to the Indonesian game if his performance on Monday is anything to go on. Without the prowling menace of Lestusen and Lestalahu PS TNI will need to have Facundo at his very best. Madura United boast their own marquee player who has hit the ground running in Peter Odemwingie. The Russian born Nigerian international who played for Stoke City seems to have had little trouble in adapting to life in Madura having scored four goals in opening six games and his performances have seen Greg Nwokolo, a player who has been there, done that in Indonesia, struggling for game time with sporadic appearances off the bench. Despite boasting such an abundance of attacking riches, Gomes de Oliveira's team have yet to find their shooting boots and despite ending against Perseru last time out with Odemwingie, Nwokolo and Boubacar Sanogo they had to make do with a single point against a team that generally travels pretty poorly. This failure to finish teams off is costing Madura United. Scoring first against Persija is one thing, the Jakarta side have been struggling for goals all season. But an impressive showing away to Arema saw Madura take the lead through the impressive Aussie Dane Milanovic but they were pegged back when Cristian Gonzales scored from the penalty spot. Against PS TNI who have their own potent threats up front Oliveira will be hoping his array of striking options will be on target or the points could well be heading back to Cibinong. Persija have said they will give their coach Stefano Cugurra, also known as Teco, two more games before deciding his future. This follows a poor start to the season when, after defeating Persiba 2-0 in their opener, the last five games have seen the Macan Kemayoran pick up two points from their last five games. Fans protested after the 1-0 loss away to Persela and the protests grew after Persija conceded a last minute equaliser to Mitra Kukar last weekend. Persija's next games are at home to Bali United this Sunday and a tricky away game at Perseru, a 5,000 kilometre trip to a stadium where visiting teams rarely leave with much more than jet lag. Club chairman Gede Widiade, who recently held an open house where fans and players got together to discuss the poor start to the season, says the two game target is not an ultimatum but a professional target. ''We continue to evaluate performances and will make a final decision after the Perseru game,' he said. He is right. For a football club with such a large fan base Persija have been a case study of how not to run a football club for so long now it stopped being funny years back. A new approach is needed within the football club but it takes time to create a professional ecosystem and football fans are notoriously short of patience with some Persija fans demanding Rahmad Darmawan stop what he is doing in Malaysia immediately and return to the club he has coached three times, winning nothing. Persija started the season well, following up the win at Persiba with a draw against Barito Putera in Bekasi. The wheels then fell off the campaign with three narrow defeats against PSM, Madura United and struggling Persela, all by the same 1-0 margin. A return to winning ways looked on the cards against Mitra Kukar last time out before ex Liverpool midfielder Mohamed Sissoko scored a late equaliser. The club have found goals hard to come by in the last couple of years and despite the recruitment of Bruno Lopes and Luis Carlos nothing much seems to have changed in 2017. The failed to get out of the group stage n the President Cup, defeating PS TNI, drawing with Arema and losing to Bhayangkara. Things didn't improve much in the Cilacap Cup, losing 2-0 to Madura United and beating hosts 1-0. Fans with long memories are casting their minds back to the 2013 season when they too won just one of their opening six games. They finished that campaign in mid table. Teco remains confident he can turns things around and doesn't feel the team is playing badly. 'In every game we are creating chances to score goals and hitting the woodwork,' he says and he is right. The team isn't playing too badly, defensively they remain strong, but they are profligate in front of goal when they do create chances. Persija fans though don't seem to be in the mood to accept mice approach play. They want results and it is the actions of the supporters that will ultimately decide the coach's future. I must admit I had to Google Malaysia's new coach Nelo Vingada. Much as I had to search on line for new Thai coach Milovan Rajevac and Indonesia's Luis Milla. It does seem a coincidence that three of the largest footballing countries in South East Asia have plumped for coaches with no experience in the region. After all, how often do we hear the plaintive whine from local football officials a new coach 'must understand the local culture'? And of course they must. After all it is a local culture that has produced a number of World Cup and AFC Asian Cup winners...oh, wait a minute. For years and years local clubs and associations have delighted in sending players, coaches and administrators overseas on so called study tours. I guess the idea of these, beyond those so important selfie moments, is to pick up a few ideas about how to do their own jobs in a more professional manner. How useful have these trips been? About as useful as marquee players I may suggest? Do you think Arsene Wenger worried too much about the culture within the Arsenal when he took over back in 1996? Here was a guy who had never won a major trophy, was French and wore glasses yet he was telling London lads like Ray Parlour, Paul Merson and Tony Adams they had to stop getting pissed all the time and could have no more Mars Bars. That there was no uproar says much about the professionalism of the players and their receptiveness to new ideas they saw could benefit their careers. Suffice to say had the PSSI, FAM or the FAT appointed Wenger back in 1996 and he had tried to interfere with diet or lifestyle there would have been a revolt and player power would have driven him out within months of his arrival. The precious snowflakes with their years of footballing success know what is needed to be successful within the parameters of their culture and anyone who tries to ignore those cultural obstacles must be shown the door. Putting facetiousness aside what does it say about local culture when Kiatisuk Senamnuang, who has pretty much earned the right to be the doyen of Thai football, is unable to convert that nation's football culture into one that challenges in Asia? Thailand has some wonderful players, certainly among the best in the region, and two of the best run clubs. Yet a wholly Thai backroom team is unable to convert that template into a team that can go toe to toe with its peers from beyond South East Asia as we have seen in their futile AFC Asian Cup/World Cup Qualifying campaign. Back to Malaysia. They enjoyed success under Rajagopal when they won the AFF Suzuki Cup back in 2010 but they never looked like taking that success and repeating it against the real Asian powerhouses beyond ASEAN. After 12 years with local coaches the FAM, under new leadership now of course, have sought to think out of the box with a coach who has worked in Portugal, China, Egypt, Saudi Arabia, Jordan, Iran, South Korea plus plus. When Steve Darby says Vingada ticks the boxes that is good enough for me. But the challenges ahead for both Vingada, Rajevac and Milla don't only lie in understanding the cloak of local homogeneous culture we keep hearing about; the bigger challenge is interpreting how the clubs and the FAs interpret that culture for their own interests. Not everyone involved in football is involved for football reasons and not all decisions taken are taken for footballing reasons. This backroom pettiness and ego-massaging are two of the biggest impediments to football success in the region and the sooner the new men can understand this the sooner they will realise how hopeless their task is! Johor Darul Ta'zim and Muang Thong United have shown what a well run football club can achieve in recent seasons. JDT won the AFC Cup back in 2015 and the Thais have done superbly well in this year's AFC Champions League. But they are professional oases amid a desert devoid of ideas or imagination. They are the exception that proves the rule sadly. They are role models, it is to Johore Bahru and Muang Thong that local clubs and associations should be sending their people to learn from, not more glamourous destinations further afield. They have shown how success can be achieved while still appearing to stay true to this local culture we always hear about. Truth be told these two clubs have outgrown such thinking and embraced professionalism but until most clubs in the respective leagues follow their example then no matter who is doing the top job is going to struggle. With the exception of the odd game the focus here has been on Liga 1 but in many ways the tougher league this season is Liga 2. There, eight groups with 61 teams are fighting for the right to play in next season's second tier. Teams finishing outside the top two face the drop in what is being described as the biggest relegation ever. As things stand the top two from each group will go through to the second round while the next four will go into a play off to avoid relegation. The bottom four teams will have to contemplate life in Liga 3 next season. As you can imagine the pressure is really on, no more so than at some of the bigger clubs, those with history and a large fan base, to ensure they will not have to face an uncomfortable future in the lowest tier. And there are some big clubs in Liga 2. Clubs with fan bases that dwarf so called big clubs in Malaysia and Thailand. Clubs with a history that pre date the Johnny Come Latelys like Buriram United, Muang Thong United and Johor Darul Ta'zim. Sadly they lack the sugar daddy who can make their dreams come true. All the same clubs like PSMS, Persita, Persebaya, PSS, Persis, PSIS, Persijap, PSIM, Persik and Persikabo could together form a pretty decent looking league with large crowds assured. Then we have newer sides with ambitions of their own. PSCS, PSGC and Martapura spring to mind in this category. And what about clubs who have moved city and changed their name in a bid to join the top table? Celebest, Lampung Sakti, 757 Kepri Jaya. The pressure to at least stay in Liga 2 has forced clubs to aim high with some appointing coaches who boast more than decent pedigree in the top flight. Arcan Iurie, Raja Isa, Fernando SalesCarlos de Mello and Jaino Matos are among the foreign coaches who have been turned to in search of the promised land. Meanwhile local coaches such as Jaya hartono, Bambang Nurdiansyah, Nova Arianto, Subangkit and Fredy Muli are among a host of big names trying their luck in this most hottest of leagues. This weekend sees the last round of fixtures before the Liga 2 stops for the fasting month and this is how the tables stand as of now. Group 8 hasn't started yet! As an example of the strength in depth in Liga 2, Persijap host PSS today while PSIS meet PPSM and PSIM take on Persebaya tomorrow. Sadly we don't seem to be getting the attendance figures for Liga 2 games this season so no idea how many will be watching these three games alone. And even for me, in my football starved area, I am spoiled for a game on Sunday with Persita v Persika, Pro Duta v 757 Kelpri Jaya, Persikabo v Persikad and even Persija v Bali United in Liga 1! With a number of the groups still very tight, for example just two points separate all seven teams in Group 7, the climax to Round One could get very messy and very bloody. I wouldn't want to be a ref or linesman! Two of the biggest names in Indonesian football, PSIM and Persebaya, meet tomorrow in Liga 2 in a clash that is sure to attract one of the largest crowds in South East Asia this week. But the final attendance figure won't be as high as it could be after local residents who live in and around the Sultan Agung Stadium said they didn't want to have any visiting Persebaya fans coming to the game. Local residents got together to rally the game organisers and security officials saying they still remember the last time Persebaya fans came to town. It was back in 2012 when Persija hosted Persebaya 1927 at the same stadium in the old Liga Primer Indonesia. I'd best explain a few things here. The year 2012 was the height of duelism with two leagues featuring teams with the same name but different ownership. In that season Persija LPI were not allowed to play their home games in Jakarta, the local Jakmania who supported the other Persija, said the imposters were not welcome. Persija then hosted Persebaya 1927 in Bantul, a supposedly neutral venue but close enough to Surabaya to ensure a large following from the City of Heroes. With no Persija fans in attendance, quite why people would want to run a football club without supporters has never been explained, the travelling Bonek kicked off in the streets and gangs around the stadium, making off with food and other items without paying and so on. The local residents haven't forgotten those scenes hence the appeal. PSIM have agreed to the request and so instead of a large following from Surabaya swelling the attendance the home side will have the stadium to themselves. This decision marks the second time a Persebaya away game has been impacted over security concerns. They have still to play PSBI after security clearance wasn't issued for the home side's small stadium and after some talk the game may have been played in Surabaya it could now go ahead in Blitar behind closed doors. While many football fans have welcomed the return of Persebaya after a few years in the wilderness not everyone is so welcoming. The team's away games often see them followed by a large number of supporters, we are talking thousands, and small towns and cities aren't able to cope with the numbers or the behaviour of some of the fans who cling to the Bonek ideal of seeing the game as cheaply as possible. The last time Persipura lost at home was against Persib in the Indonesia Soccer Championship last July, The last time they lost on their own patch in the league was five years ago to the day...well, minus one day. When Boas made it 3-0 with nine minutes remaining it looked like yet another game, set and match for the Black Pearls. Bhayangkara fought back however and a goal from Furtuoso, his third of the season, om 83 minutes set the game up for a nervy climax. Ilham scored in injury time to make it 3-2 but by then it was too little, too late. The bottom two sides met up at Tri Dhamma Stadium in front of a sparse crowd but Persiba's new coach Milo Seslija was unable to halt his side's poor run. Gresik's win puts them three points ahead off the cellar dwellers who will be hoping their return to Balikpapan in the near future will spark a recovery of sorts. Teco Out! The cry went out at the final whistle after ex Liverpool midfielder Mohamed Sissoko netted a last minute equaliser to deprive the home side of a valuable three points. Persija now have one win, two draws and three losses from their opening six games but while this point ended a three match losing streak it was not enough to cheer up the home support. After the game it took veteran Bambang Pamungkas to force the players to show some appreciation to the fans as the team headed to the dressing room in sombre mood. Later some of the fans heckled the team as they got on the team bus to return home. Persija are 15th in the table now but at least have another home game to ook forward to when they entertain Bali United next weekend. After that they face a tricky trip to Perseru. One story doing the rounds suggests Teco has those two games to turn things around. One point from the last two games means Arema have fallen a little bit off the pace after their fine start to the season and here they needed a second half penalty from Cristian Gonzales to save their blushes against a resolute Madura United side. Again Arema went for Gonzales and new import juan Pino meaning no starting place for Dedik Setiawan again after scoring three goals in his first three games. Since opting for the expensive foreign strikers Arema have failed to score from open play and it must be concering coach Aji Santoso they have scored five goals from their six games this season. Pardon the pun but when you take on PS TNI you know you will be in a for hard fight but this game was ultimately marred by one of the worst refereeing performances it has been my misfortune to witness. The first half was shocking by the man in the middle and their were supporters around me calling for the hapless whistler to be replaced at half time. The old adage was you had to earn the right to play and if you wanna play against PS TNI then you need to match their physical approach. Then again this is Indonesia and that ploy may not be appreciated in certain quarters. The Army Men do get in the faces of their opponents early on but make no mistake, they can also play a bit. Surprisingly Laurent Hatton was replaced as coach despite being unbeaten after three games but Ivan Kolev has come in, replaced the foreigners, kept the physical nature but added some guile especially up front. Elio Martins and Leonel Nunez have impressed since they arrived, Nunez's goal was nice, and at the back Facundo is that old school defender, bawling instructions non stop and ready to argue with anyone not on his side. But PS TNI aren't all about the foreigners. They also boast promising young talent like Manahati Lestusen. But as they set about PSM who have shown themselves to be a more than useful side themselves it is worth pointing out the home side were without Abduh Lestalahu while Gustur Cahyo Putro only came on in the second half and Guntur Triaji never got a run out. Second half, when the ref focussed more on his job, PSM had the chances to earn at least a point and fully deserved it would have been. In Wiljam Pluim they have perhaps one of the finest imports of recent seasons while further forward Reinaldo showed the benefits a bruising centre forward can bring to a team. The second 45 minutes was as good an advert for Indonesian football as the first was bad. 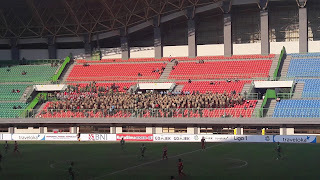 Despite the quality in their squad it remains to be seen whether PS TNI will ever appeal to a fan base beyond off duty military personnel wearing military fatigues no matter how good their support was. As for PSM, they will play much worse and still win. No More Pyro, No More Party? Since last season football authorities have been clamping down hard on flares inside stadiums, handing out hefty fines to clubs whose fans misbehave and set them off inside the stadium. Flares have long been a part of the terrace culture here and add to the the colour and the atmosphere but could those days be coming to an end? posters that highlight the evils of flares and the damage they can do to fans and players alike. But then England is the ultimate nanny state, a nation of snowflakes who are warned in advance should a news report feature flash photography! Now though it seems the message is getting through to Indonesian fans and in the absence of any serious security they are taking to policing themselves as a couple of recent incidents highlight. Towards the end of the Persela v Persija game at Surajaya Stadium a flare was let off on the home terrace. Supporters moved quickly to extinguish the smoke and, umm, point out the gentleman they feel was the offender. In Surabaya 24 hours later a flare was thrown on to the pitch from the East Terrace after Persebaya took the lead and the game was held up for a few minutes while stewards rushed to douse the smoke. Meanwhile on the terraces other supporters made their feelings known to their fellow fans with a series of less than complimentary chants. Personally I don't see much wrong with the odd flare or two. I would rather officials got serious about supporters smoking inside the stadium, surely more dangerous than any pyro, but I feel I am in the minority there. That is one kind of smoke that is most definitely permitted inside the stadium. Bambang Pamungkas may no longer be a starter for Persija but the 36 year old striker is still the man who understands the club and the club's connection with its large fan base and his influence within the club remains immense. That influence was evident last week when I saw the game at Persela. It was strange seeing him wearing a bib and warming up with the other substitutes at half time but there was absolutely no indication he was some big time Charlie going through the motions and engaging in some banter. Indeed, while Bambang was most definitely part of the group stretching together he was most definitely putting the most effort in to the moves. His focus was on doing the exercises, not having a laugh. As the players came on for the second half Bambang was there with an arm around the shoulder and a quiet word for some of the younger lads, passing on his experience and his wisdom. And after yesterday's disappointing draw at home to Mitra Kukar when a late equaliser from Mohamad Sissoko cost Persija three points, the home fans let their displeasure known as the players gave them a half hearted wave before heading for the tunnel. Even with the dissent echoing round the stadium Bambang was waving his team mates back out towards to the middle of the pitch to show some appreciation for the incredible support they had received during the game. Marquee players will come, pocket large pay cheques and go but it is players like Bambang who understand the hold the game has on people and reassures us amid the sometimes brutal world of Indonesian football there are some people who can see beyond their own egos and bank balances. Simon McMenemy's side came from behind to overcome plucky Gresik at the Patriot Stadium to make it back to back victories following their loss at home to PS TNI. Those hashtags calling for coach Djadjang Nurdjaman to be sacked have soon be forgotten. Persib's third win on the spin saw them move to the top of the Liga 1 at least for a few hours. Carlton Cole started, got booked and was taken off at half time. Essien, on as a second half substitute, scored with a penalty just shy of the hour mark. There is no telling which player will adapt quickly to Indonesia and which won't. Odemwingie is sure hitting the ground running as he scored his fourth goal of the season to give his side the lead against Perseru. If the home side were expecting to go on and win this game though they were sadly mistaken. The visitors were level within 15 minutes. This was their first away point of the season, last year they picked up five on the road. PS TNI moved up to fourth after this hard fought win which saw 10 yellow cards dished out, including seven for the visiting side. With new coach Milomir Seslija in charge of his first home game Persiba showed flashes of what they could do but ultimately lacked the quality Sriwijaya possess in spades. Mind, if it wasn't for a couple of quality of saves by Sriwijaya keeper Teja Paku Alam who knows what might have happened. Nine yellow cards, seven for the visitors. Enjoyed this game. Ultimately the difference between the two teams were the differing threat posed by Fahmi Al Ayyubi and Ivan Coehla. Another quality performance by Andritany in the Persija goal kept the score respectable but the Macan Kemayoran had the chances to salvage a point from the game. More about where this result leaves the Persija coach Teco can be found here. Arema conceded their first goal of the season as they fell to their first loss of the season is this thriller from Makassar. They also ended the game with 10 men after Junda Irawan received a second yellow card on half time. Reinaldo scored the only goal of the game on 56 minutes and despite playing with 10 men for half the game Arema were still able to cuase problems for the home side. Despite scoring three goals in three games, coach Aji Santoso dropped Dedik Setiawan and partnered Cristian Gonzales with Juan Pino up front.